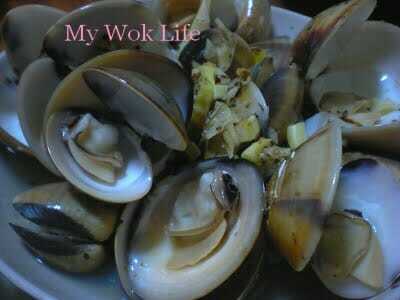 Clam is one of the seafood I love most. Easy to prepare and it goes well with any kind of cooking method. The simplest way, to steam it! Choose medium to large shells for more fleshy meat inside. How to choose good clams? I do not really have the best method to choose them, but at least sniff the clams from a short distance to determine if they are still good to eat or going bad, if they smelt fishy. it is better to get clams early in the morning at the wet markets as the clams are likely to be alive, still. So, don’t be afraid if you see it moves! The price of clams is low, too. With less than S$5, you may be able to get more than a bucket-full of clams. Kailan, also named Chinese broccoli or Chinese kale. Many people like the crunchy texture of this leavy vegetable with thick stem, but often complain its mild bitter taste, too. Some readers asked me if I have a better to cook Kailan. 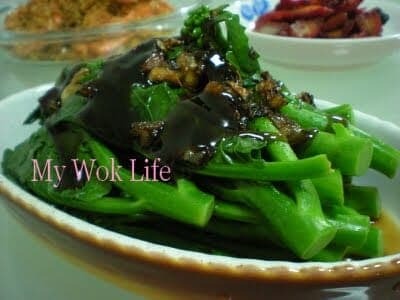 Seriously, unless is baby kailan, I will not use stir-frying method as it does not sound appetizing to have the thick kailan stir-fried. I think, this is probably the best way to cook and taste Kailan without its inherited bitterness. Not sure what to have for lunch? I had plenty of Szechuan vegetable soup cooked in excessive portion for dinner on a weekend yesterweek. But the pork ribs in the soup were all finished up the same night, left only the vegetables with soup. Plenty of soup! 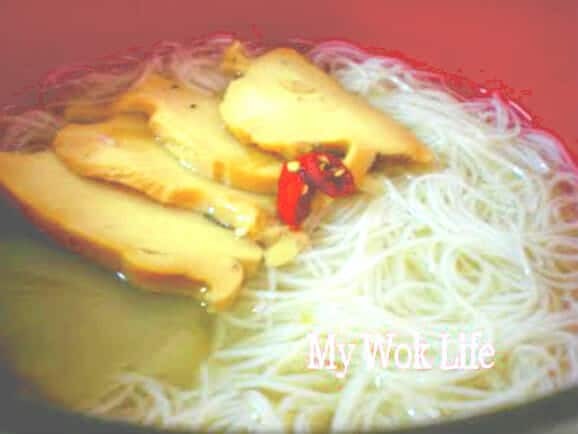 It would be a waste to discard the soup, I used it to cook bee hoon soup for my lunch the next day. 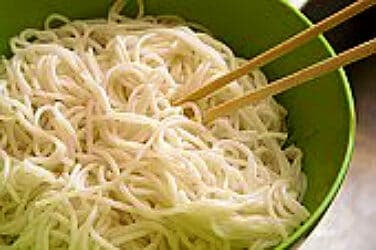 Yes, since there was a can of abalone in my storage bought during CNY, it would be good to enjoy it with my plain bee hoon (rice stick or rice vermicelli) soup! 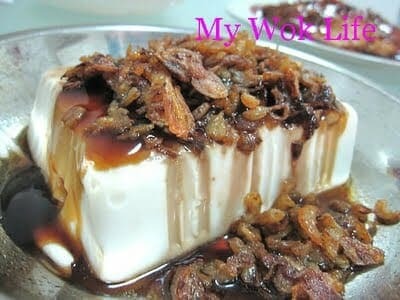 This is a very delicious and simple tofu dish. I kept the whole dish, and wanted to finsih up all by my own. Just like what my reader, Anne, told me that her son rated her cooking with 100 marks, for some pork dishes cooked with my recipes. I created this pork meat cake,and hope Anne (and any of you) could try and receive compliments from her loved ones again (winking smile)! My little one did praise me for making this meat cake for her.. As for her who does not really like pork, she loved this meat cake so much! This meat cake creates aromas in the bites. And I loved it with a touch of five spice flavour, not too strong but enough to taste its fragrance. However, not many children like five spice flavour, if your kid doesn’t, omit the five spice powder and substitute with some ground white pepper. Yeah, just call it a pan-fried meat cake dish will do (smile). 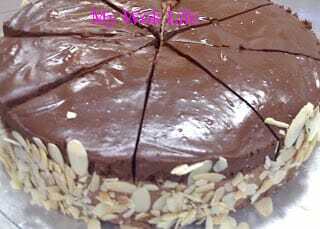 When this torte was first made, it looked deceptively dense and overly rich. I thought this might be a failure to my first torte baking. But guess what? It was a big hit by my family and friends! 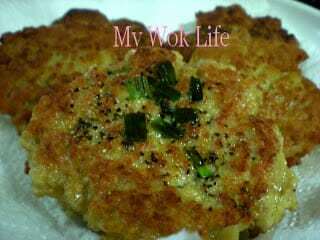 As for me, I had it for my tea session over the weekend, reading my favourite lifestyle magazine while enjoying this own-baked savoury treat~ Yes.. and “No” (smile), it wasn’t overly rich for the taste bud. Instead, the taste was just right to bring out the true sensation! True creamy chocolaty taste, and pleasantly sweet without being overpowering. Texture of the cake is dense (that’s why it is called “torte”), but it is perfectly matched with the soft and smooth mousse cream in between the layers (Yes, torte is supposed to make in layers). Its density complements the silky mousse cream and chocolate topping, creating an overall taste of perfection! 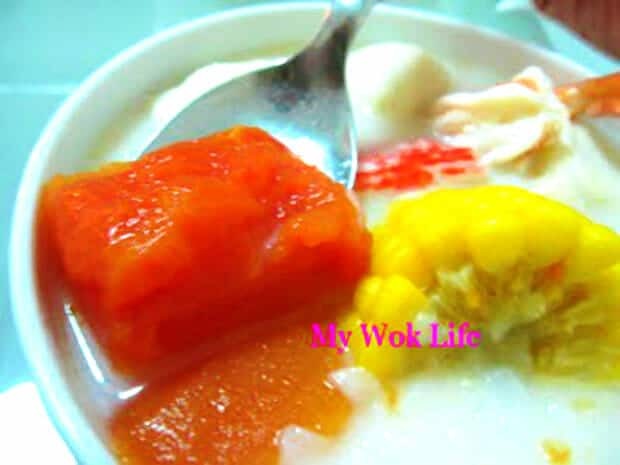 The inspiration of cooking papaya soup came from the famous payaya bee hoon soup served in Xin Wang Hong Kong café, when visited their café and ordered this papaya soup (chose instant noodles to go with it) for my late dinner, after the NDP preview on the 1st Aug. I was wondering if this papaya soup could be cooked at home and taste as nice. Yes, you can definitely do it.. I tried (laughing)! I have been sharing this piece of nutritional information with my readers in My Wok Life’s Face Book Fan Club. I did not post it up earlier on, because these types of nutritional tips/ information were supposed to be exclusive to my readers who joined me in my FB, as promised. However, it seems to be something useful to know, for the sake of your health, if you are one who hasn’t really came across this message. Hence, I decided to have it posted in my blog today, to share it with ALL, even if you are not in my FB.. Just this one… The rest of other interesting information, you are still invited to log on and be my FRIEND, to know it all and have the first-hand information! Yeah, the FB Fan Club already has gotten to read this since a month ago…(chuckling)!